Last week-end Tory Historian was wandering round Islington in London, carefully avoiding the very small trendy part of the old borough (there was, after all, a Fair Maid of Islington in the early eighteenth century and a Bailiff's Daughter of Islington mentioned in Percy's Reliques of 1765) and came across the statue of Sir Hugh Myddelton. Although the man is clearly a hero in that part of the world, there was very little information about him on the pedestal. So, Tory Historian decided to investigate. Traded as a goldsmith, banker, and clothmaker; alderman of Denbigh 1597; M.P., Denbigh, 1603, 1614, 1620, 1623, 1625 and 1628; the London corporation having obtained a permission from Parliament to bring in a stream from Chadwell and Amwell, offered to execute the work. compelled by opposition and demands of the landlords to apply to James I for money, on which James paid half the cost on condition of receiving half the profits (the canal, which was about thirty-eight miles long, ten feet wide, and four feet deep, completed 1613); obtained large profits from some lead and silver mines in Cardiganshire, 1617; began reclaiming Brading harbour, 1620; created baronet, 1622. One must assume that James I reclaimed a substantial part of that money in return for the baronetcy. Nevertheless, one can begin to see why Sir Hugh Myddelton should be a hero, being the man who helped to bring clean water to London. 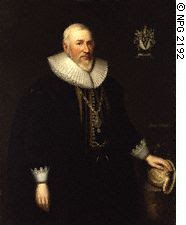 The DNB also lists two of his brothers: Sir Thomas Myddelton (1550 -1631), who was Lord Mayor of London in 1613 as well as being alderman and sheriff in 1603, the year in which he was knighted and a member of the Virginia Company and an original member of the East India and the New River Companies; and William Myddelton (1556? - 1621), a poet and a seaman, who between expeditions wrote on Welsh prosody and published a metrical version of the Psalms. Quite a family. There was also a nephew, son of the Lord Mayor, also Sir Thomas (1586 - 1666), a lawyer and Parliamentarian, fought in the Civil War on the parliamentary side, mostly in North Wales but also took up arms on behalf of Charles II in 1659. He does not seem to have been entirely successful in his military career. One thing to be noted is the longevity of the entire family. Apart from William, who died in his late sixties, they lived into their seventies and eighties, a remarkable performance in those days, both because of diseases and general danger to people who were nor precisely quiet stay-at-home wallflowers. The due supply of pure spring water to the metropolis, had often been canvassed by the corporation. At times it was inconveniently scanty; at all times it was scarcely adequate to the demand, which increased with London's increase. 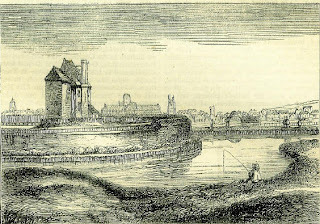 Many projects had been brought before the citizens to convey a stream toward London, but the expense and difficulty had deterred them from using the powers with which they had been invested by the legislature; when Myddelton declared himself ready to carry out the great work, and in May 1609 'the dauntless Welshman' began his work at Chadwell, near Ware. Naturally enough there were many opponents to the scheme. The engineering difficulties of the work and its great expense were by no means the chief cares of Myddelton; he had scarcely began his most patriotic and useful labours, ere he was assailed by an outcry on all sides from land-owners, who declared that his river would cut up the country, bring water through arable land, that would consequently be overflowed in rainy weather, and converted into quagmires; that nothing short of ruin awaited land, cattle, and men, who mightbe in its course; and that the king's highway between London and Ware would be made impassable! All this mischief was to befall the country-folks of Hertfordshire and Middlesex for Mr. Myddelton's 'own private benefit,' as was boldly asserted, with a due disregard of its great public utility; and ultimately parliamentary opposition was strongly invoked. The King's support and financial help seem to have been vital for the project, so one must not begrudge whatever profit James I himself made out of the whole project, not to mention the undoubtedly large sum that he extracted from Myddelton later on (as I suggested above) for that baronetcy. The building of the canal seems to have taken about 15 months (which raises certain questions, possibly not entirely appropriate to a history blog, about present day projects that are built or not with a great deal more mechanical assistance) and the New River was formally opened on September 29, that is, Michaelmas Day, 1613 with a great deal of pomp and circumstance, not to mention pageantry, as is to be expected from all events Jacobean. After speech making in verse, the floodgates were opened and the new canal began its function. London had its first taste of clean fresh water that flowed directly to the city. Famously, Hayek maintained that he was not a conservative or a Conservative with a capital "c". 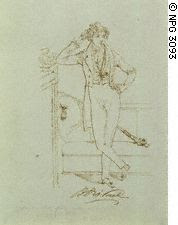 He is, nevertheless, the man who has influenced a good deal of modern conservative thinking. Right now he is out of fashion with the Conservative Party but his time will come again. Hayek saw himself as a Whig or an old-fashioned Liberal, political categories that have been subsumed in other parties, notably the Conservative one of yesteryear. At the end of the "Constitution of Liberty", the book Margaret Thatcher was supposed to have shown to the Conservative Central Office policy wonks on her election as leader of the party, explaining that this was what she believed in, there is a chapter: "Why I am not a Conservative?". The main merit of the individualism which Adam Smith and his contemporaries advocated is that it is a system under which bad men can do least harm. It is a social system which does not depend for its functioning on our finding good men for running it, or all men becoming better than they are, but which makes use of men in all their given variety and complexities, sometimes good, sometimes bad, sometimes intelligent, more often stupid. One really cannot say it any better or more elegantly. Politicians reflect the society around them. There is no point in expecting them to be any better than the rest of us either morally or intellectually. It was ever thus. Why should they be? So, the answer is to have a system in which they can do the least possible harm. I leave it to our readers to discuss whether that is what we have in Britain at the moment. Tory Historian was browsing through the Defense Visual Information Center's photographic archives - all freely available for use by the public - and came across this remarkable and moving picture. This was taken on May 13, 1945. The war in Europe had finished but the war in the Far East was still raging. The picture is that of the bombed out Coventry Cathedral where wounded US troops from nearby hospitals were attending a Mother's Day service. Another dam' long screed, to misquote the Duke of Cumberland's comment to Edward Gibbon. Scribble, scribble. To continue the saga of the propaganda war waged after the Reichstag fire. The first aspect of the counter-offensive was “The Brown Book”, followed later on by “The Second Brown Book”. Münzenberg mobilized many of the West’s intellectuals whom he had already enmeshed in his network or the Münzenberg Trust as it was known, to support this endeavour. Names of others, such as Albert Einstein, who protested, were simply added. Katz, the ruthless manipulator and brilliant propaganda writer, was accused of Zionism and espionage, confessed to all his “crimes” and begged to be executed as he had no right to live. His masters obliged and he was hanged. As Stephen Koch, author of “Double Lives” and Sean McMeekin, author of “The Red Millionaire”, Münzenberg’s biography, argued “The Brown Book” so highly praised at the time and so valued by various historians, was largely a pack of lies. In fact, the lies were not really substantiated and only self-imposed hypnosis could have made all those writers and reviewers swoon with praise at the time. There were three parts to the book. The first one told inaccurately of the Nazi rise to power, blaming largely the Social-Democrats and, naturally enough, being rather reticent about the war the KPD waged on the SD and the Weimar democracy in general. The second part dealt with Nazi oppression in general and was, as Sean McMeekin puts it, “intuitively correct”, though short on facts. “The Brown Book” emphasised oppression as it affected left-wing parties and individuals not those dreadful people, capitalists, under which rubric came anyone who did not support the KPD. Nor was there anything about the growing persecution of Jews. Instead of giving examples, the book and its supposed author, merely quoted Lenin’s attack on rich and powerful Zionists, adding quite dishonestly, that rich German Jews had not felt any discomfort under the Nazis. In fact, there was a great deal of indignation that the Nazis accused various non-Jewish left-wing and, above all, Communist activists of being that. How ironic that the real author of this document should have ended his life as a “Zionist spy”. Communist history is full of ironies of this kind. The third part dealt with the Reichstag fire and produced the accusations that it was organized by the Nazis, specifically by Göring. To prove this there were fraudulent charts and “photographs” produced that showed a network of subterranean passages through which the Nazis could have entered while Van der Lubbe was torching the place, to give him a hand. To top the accusations, there were clear innuendos that Van der Lubbe was the SA Chief Ernst Röhm’s catamite, possibly a sexual toy boy to the SA in general. Even at the time this was thin and has since been disproved quite categorically by, among others, Fritz Tobias in his 1964 book, “The Reichstag Fire”. No other writer has produced any evidence to back the half-baked assertions of “The Brown Book” and “The Second Brown Book”. They have, nevertheless, penetrated into popular psyche to quite an astonishing degree. Münzenberg’s other ploy was the London counter-trial, the template for many other subsequent “trials”. It was timed to open the day the Leipzig trial of Van der Lubbe, Dimitrov and the others was to start, September 21, 1933. The counter-trial was chaired by D. N. Pritt KC, barrister and member of the Labour Party, who was also one of the leading fellow travellers. In subsequent years he would use his standing as a barrister and a “silk” to explain why the Soviet show trials were legally entirely correct and how the guilt of the accused had been proved beyond any reasonable doubt. The other "judges" were Maìtre Pierre Vermeylen of Belgium, George Branting of Sweden, Maìtre Vincent de Moro-Giafferi and Maìtre Gaston Bergery of France, Betsy Bakker-Nort of the Netherlands, Vald Hvidt of Denmark, and Arthur Garfield Hays of the United States. The lawyers, except for Pritt, complained about the atmosphere in the “court room”, the pressure under which they were put by Münzenberg, the lack of evidence and the laughable testimony produced by friends of Willi wearing SA uniforms and masks. For all of that, the counter-trial was a huge success. After a week’s deliberation it came to the conclusion it started with, that the fire had been initiated by Göring and carried out by SA officers, with Van der Lubbe, probably a homosexual lover of one or more of them, lined up as the fall guy. This was, astonishingly enough, accepted by all the bien pensants and many other well-meaning people. Meanwhile, the real trial, in Leipzig was also a success for the Comintern. Dimitrov [pictured on the right], a superb speaker, dispensed with his defence lawyer and used the four month long trial to proclaim repeatedly his and his comrades’ innocence and the Nazis’ guilt as well as the guilt of all those who did not support the Communist line. Van der Lubbe [pictured on the left], by now probably heavily drugged, drooling and giggling, continued to insist (in so far as he could insist anything) that he did it all by himself to call attention to the problems of the German workers. On December 21 the trial came to an end. Van der Lubbe was found guilty and subsequently executed. The charges against the others were dismissed for lack of evidence, something that would not have happened under Stalin and did not happen at the counter-trial. Ernst Togler was kept in “protective custody” until 1935, then released. He was purged from the KPD because of his surrender to the police, went abroad and worked in Belgium, returning later to work, according to him under duress, for the Nazi Ministry of Propaganda. He survived till the early sixties. Dimitrov, Tanev and Popov returned to the Soviet Union in February 1934, almost exactly a year after the fire to a hero’s welcome. Why were the charges dismissed? One theory is that the German courts were still sufficiently independent not to bow to pressure from the Nazi hierarchy. This is not impossible. Another aspect of the story is the arrest of seven German airmen who were undergoing training secretly in the Soviet Union. They were released after the Bulgarians had been acquitted and sent back to the USSR. It is hard to dismiss the notion of some agreement there. Stephen Koch thinks that the agreement went deeper and the whole Leipzig trial was a put-up job, with both Hitler and Stalin seizing the opportunity they were presented with. Back in the USSR Dimitrov became head of the Comintern and a fervent Stalinist, though Robert Conquest mentions in “The Great Terror” that he, unusually, tried to save some of his Bulgarian comrades during the purge and may, even, have succeeded with one. Whether he tried to save his co-defendants is unclear but, in any case, he did not succeed. Both Popov and Tanev disappeared into the Gulag, with only the first of them emerging after many years. Dimitrov eventually became the Prime Minister of Communist Bulgaria and died in 1949 while on holiday in the Soviet Union. Rumours of him having been poisoned or irradiated have persisted ever since. It is true that Stalin had been displeased with his secret negotiations with Tito. And what of Münzenberg, the evil genius, the man who created the modern intellectual atmosphere, who unknown to most and working in the shadows, consolidated Western opinion about at least two crucial events? Alas, he did not live long enough to see the network he had set up of front organizations, fellow travellers and agents of various kind achieving their biggest success of demonizing Senator Joseph McCarthy and all who were associated with him and turning the Communist agents he had tried to uncover into martyrs. That opinion, too, persists to this day, as witnessed by the completely untruthful “Good bye and good luck” made by George Clooney and despite the research of such people as Ronald Radosh, author of “Red Star Over Hollywood” and the Yale University series of published documents about American Communist activity. Another triumph for the real propaganda. Willi, however, had no more triumphs after 1933 though he continued to weave his spider’s web for a while. From 1935 on he watched his various friends and comrades disappear into Stalin’s prisons to reappear in show trials. He was purged from the KPD and in 1938 he broke with Stalin. He then spent two years talking to British and French agents, explaining to them the truth or as much of the truth as he was prepared to divulge about the Soviet Union and the Comintern. He also started making plans for another propaganda campaign some time in the future, a left-wing anti-Soviet one. Many of his ideas were taken up after the war by the organizations and publications that came out under the auspices of the Congress for Cultural Freedom but Willi did not live to see that either. He did carry out one coup against Stalin. Soon after the Nazi-Soviet Pact he published the names of 40 German Communists who had been murdered in the Soviet prisons. In early 1940 he was interned in France with all other German citizens. He had been advised to submit to that rather than try to escape by a couple of British agents he had been in touch with. Unfortunately, apart from the fact that Willi must have been watched by the NKVD, this was the period when the various British security services played unwilling host to a number of Soviet agents. As the French surrender drew closer those in internment camps were either released or allowed to escape. Münzenberg headed off with a group southwards but reaching Montalon separated from the main group with three others, promising to return later. None were seen again. One, Hartig, a supposed left-wing social-democrat, turned up later in Paris and worked with the Nazis. Two other young men, who had made enormous efforts to befriend Willi vanished. This was June 21, the day of France’s surrender. In October of that year, a body was found in the woods nearby of a man who had been hanged but as the rope had snapped, he had fallen under the tree. The body was in a very bad state of decomposition but papers in his pocket showed that this was, indeed, the former propaganda chief of the Comintern. Some people think of it as a suicide but most assume that the two young men were working for the NKVD who wanted Willi dead and who accomplished the crime, possibly with the help of the Gestapo. In any case, what matters is the evil that he did and that lives on. Few people know the name of Willi Münzenberg of his henchman Otto Katz. Yet over several decades millions across the world have repeated “truths” and opinions that had been created for them by these two. Not many people believed Dr Göbbels’s “big lie” but too many still believe the medium lies that were piled up by the Comintern. As I said at the beginning of this long discussion, in the first posting. That is propaganda. Here is an interesting question for all our readers? Who burnt down the Reichstag in 1933? Can you recall the name of Marinus Van der Lubbe, the somewhat crazed Dutchman, who actually set it on fire? And even if you can, do you not think that there was somebody behind it all? After all, it could not be just a lone lunatic? That, ladies and gentlemen, is the difference between good and bad propaganda. Further, Hitler did take advantage of the fire to do what he had always planned to do and destroy the remnants of German democratic parliament. All of that is true. Now we come to the battle of the propagandists. Everyone, but everyone, quotes Dr Göbbels’s comment about the big lie and compares every would-be spin doctor with him. But who actually believed Göbbels? A large proportion of the German people for a time and some supporters in other countries who wanted to believe him. As opposed to that, millions of people across the world repeat certain “truths” for which there is “full agreement” without once realizing that it is propaganda first started by that genius of spin doctoring and promoter of the Comintern, Willi Münzenberg [pictured above], without even knowing his name or comparing any tuppenny-ha’penny press officer to him. Now that is propaganda. Sheer genius. Back to the Reichstag fire. It occurred on the night of February 27, 1933 and the perpetrator was not hard to find. Van der Lubbe, a supposed Communist and an unemployed bricklayer, clearly mentally retarded, was found inside the building. The following day the recently elected Chancellor, Adolf Hitler, went to see the President, Hindenburg, who signed an order that closed down all non-Nazi parties and banned the Communist one. A few days later the Gestapo arrested four Communists, intending to try them with Van der Lubbe. Ernst Togler was a senior member of the KPD (Kommunistische Partei Deutschlands, German Communist Party), one of those who had not managed to escape. An arrest warrant was issued for him immediately and he surrendered himself to the police, something the KPD would later hold against him. The other three were Bulgarians: Georgi Dimitrov, Vasil Tanev and Blagoi Popov, members of the Comintern. What the Gestapo had not realized that Dimitrov was the head of the West European section of the Comintern and, thus, a close adviser of Stalin’s, one of the few people the latter would make an effort for. Normally Communist parties and their members would be sacrificed without a blink of an eyelid. In addition, the man who had been charged to promote the cause of the Soviet Union and the Communist International through apparently innocuous publications, Willi Münzenberg was reasonably anxious to become involved. Münzenberg was a German Communist, one of the few from a working class background. He was a deputy in the Reichstag and the owner of two newspapers and a publishing firm. He was also the most skilled propagandist the Soviet Union and its cause ever had. He did not write propaganda, he organized it, setting up hundreds of committees, using front organizations to run other front organizations, inspiring intellectuals to become fellow travellers and to manipulate other, innocent and ignorant intellectuals. In other words, he was the man who created the atmosphere in which it is considered to be normal to be on the left of the spectrum and intensely moral to support some of the worst tyrants in the world, as long as they seem to be a left-wing cause. He wanted to instill the feeling, like a truth of nature, that seriously to criticize or challenge Soviet policy was the unfailing mark of a bad, bigoted, and probably stupid person, while support was equally infallible proof of a forward-looking mind committed to all that was best for humanity and marked by an uplifting refinement of sensibility. Before 1933 he had been enormously successful in his organizational activity. His biggest achievement was the Sacco-Vanzetti case. He took the case of two obscure Italian anarchists who had been accused of robbery and murder (of which Sacco was almost certainly guilty and Vanzetti possibly innocent) and turned it into a left-wing cause célèbre, achieving two things. The campaign pulled together disparate left-wing and well-meaning individuals and organizations under covert Communist control, in the process destroying the anarchist movement in the United States. It countered the potent myth of the Open Door and the American Dream for immigrants, a rival myth to that of the Soviet utopia, by creating an image of America of a murderous, xenophobic society that destroys innocent immigrants if they happen to have the wrong political view. We can date the irrational anti-Americanism so prevalent in Britain, Europe and the American left from that campaign. Münzenberg’s work lives on. In the months leading up to Hitler taking power the entire KPD behaved with exemplary foolishness, underestimating the Nazis and concentrating on internal dissent, purges and the fight with the Social-Democrats. Münzenberg was part of that mess. Immediately after the Hindenburg decree he fled to Paris where he began to organize a counter-offensive. Tory Historian is a great admirer of Benjamin Disraeli, the presiding genius of political spin doctors, as the historian John Charmley once put it. One could never put it better oneself. Nothing like consulting great Tory thinkers. Tory Historian is back on line. Tory Historian has been, unsurprisingly but only temporarily, flummoxed by modern technology, to wit, new blogger. Therefore, postings will be indirect, through Helen, while Tory Historian consults greater minds. With the help of the Great Doctor, normal service, we hope, will be resumed as soon as possible. In the meanwhile, look upon Helen's postings as those emanating from Tory Historian. Certainly one can argue as one reader did very forcefully and Tory Historian somewhat less so, that Lincoln was not in any real sense a conservative. There can be no such argument about the fortieth President of the United States, Ronald Reagan. Tory Historian is fully aware that a couple of Reagan quotes went up on this blog very recently but this story is not a very well known one and is worth repeating. It comes from a book already mentioned in a previous posting: John O’Sullivan’s “The President, the Pope and the Prime Minister” and describes an episode that took place in 1984, when Reagan was over in France for the 40th anniversary of the Normandy landings. For some reason, hard to discern now, the American President who had been the first to be called a cowboy and a bully by the West Europeans who were sheltering under the NATO umbrella was temporarily quite popular with the French government and with President Mitterand. Here is the story from O’Sullivan’s book. To understand it fully one must remember that Reagan had volunteered for the US Army six years before the outbreak of World War II but because of poor eyesight and deafness in one year was assigned to making films for the armed forces at the outbreak of hostilities (I suspect, that means 1941). Later that day [of Reagan’s address to the veterans], Evan Galbraith, the U.S. ambassador to Paris, brought the president some heartwarming news. The French government had decided to award him a decoration. Galbraith had not been told exactly what decoration; he thought it might be the Croix de Guerre. “The Croix de Guerre,” said Reagan, looking distinctly upset. “I couldn’t possibly accept that. That’s for bravery. All I did in the war was to fly a desk.” He asked Galbraith to find out if it were true and to solve the problem. Some time later the ambassador returned with the good news that the decoration was the Legion d’Honneur. But Reagan was still not quite satisfied. What was the citation? What were they giving him the honour for? As the famous saying goes: they don’t make ‘em like that any more. Tory historian promises to keep away from American subjects next week. One thing leads to another as I have had occasion to mention. Another article led me to quote Abraham Lincoln’s famous saying about not being able to fool all of the people all of the time – a saying that all politicians should repeat to themselves every day – and to find a few other rather good ones. It is, of course, debatable whether Lincoln was a conservative. The conclusion one comes to is much like the conclusion one comes to on most politicians: depends on what you mean by conservative. Freedom from slavery, all slavery, is an important part of conservative thinking now, though it was not necessarily so in the middle of the nineteenth century. Tory Historian has just acquired a copy of Jeremy Black’s latest work (how does the man do it?) on the slave trade and is looking forward to reading it and sharing opinions with readers of this blog. At the launch Professor Black made the straightforward and obvious comment that slavery has been the norm throughout most of history. One might argue that it has never been completely abolished in some parts of the world either in the state or private form. What is unusual, though Professor Black did not say it, is the assumption developed in parts of the western world in the middle of the eighteenth century that slavery in any shape and form was wrong. Going back to Lincoln, though, his views on trade – he was a complete protectionist and believer in high tariff, which was one of the causes of the War Between the States – would have delighted some Tories and the odd Conservative now. Others run from the idea in great terror. When they stop running they point out that most Anglospheric countries have done extremely well under free trade arrangements. Indeed, the sheep and the wolf rarely agree on anything.